Customer and Supplier Friction Is Gone. FSMA, GFSI, and risk mitigation require manufacturers to collect and review massive amounts of documentation and data for their suppliers and items. The qualification process for suppliers and items is labor intensive and inefficient, using outmoded tools such as email and spreadsheets. Companies have limited visibility into the performance of suppliers and their items. Suppliers are backlogged and slow to respond to requests, often filling out the same forms and answering the same questions again and again. When forms are collected, they are filed away and the data cannot be mined for business insights such as risk profiling, trending, and other key information. TraceGains Supplier Management streamlines supplier qualification and sourcing by collecting and digitizing supplier documents, extracting the relevant data, and arranging it into performance dashboards and reports. 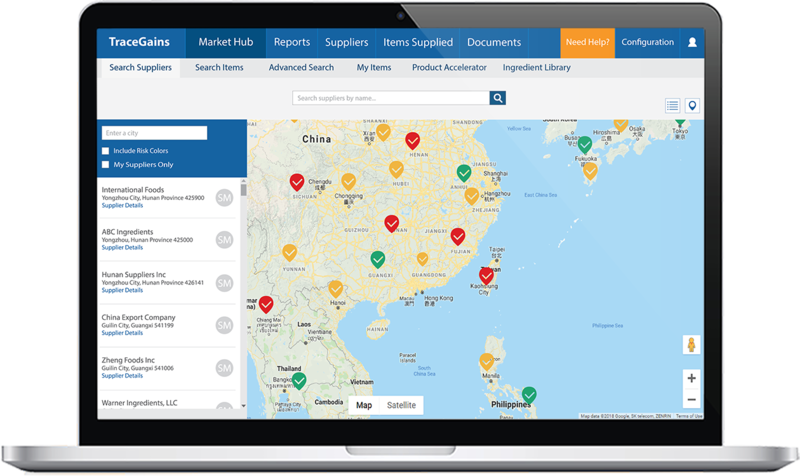 Users can choose standard or custom dashboards for allergen, organic, country of origin, nutrition, risk analysis, and other mission-critical data. The system generates automatic alerts when supplier documents are missing, incomplete or about to expire. Leveraging TraceGains Network, users can easily connect with suppliers and necessary documents are instantly delivered from a vast supplier document repository. With PostOnceTM technology, suppliers fill out forms once, and all customers are updated, eliminating redundant requests. These capabilities make supplier qualification and sourcing more efficient, provide better insight into supply chain risk, and accelerate time to market. "I explained to the auditor that we use TraceGains for our regulatory documents and CoAs. The auditor said he was very familiar with TraceGains and that he didn't need to question any further. We did really well! I just wanted to let you know how important TraceGains is to KanPak. You are the best!" TraceGains and ESHA Research have teamed up to provide shared customers with a new and innovative solution – DataLink. This solution allows customers running both TraceGains and Genesis the ability to update supplier ingredient data without having to manually enter amounts by item.